Heat a medium nonstick skillet to medium heat. Add cinnamon stick, peppercorns, mustard seeds, coriander seeds and cloves to the hot pan. Toast the spices for about 60-90 seconds, until fragrant and slightly toasted. Let the spices cool, then place in a small food processor. To the food processor, add paprika, turmeric, honey, apple cider vinegar, garlic, ginger and chilies. Process the mixture until it forms a paste. If too thick to form a paste, add a tablespoon of water at a time until paste forms. Place onions, chicken, diced tomatoes (with juice), coconut milk, pumpkin puree, salt, pepper and spice mixture into the slow cooker and stir to combine. Cook for 3-4 hours on high or 7-8 hours on low. 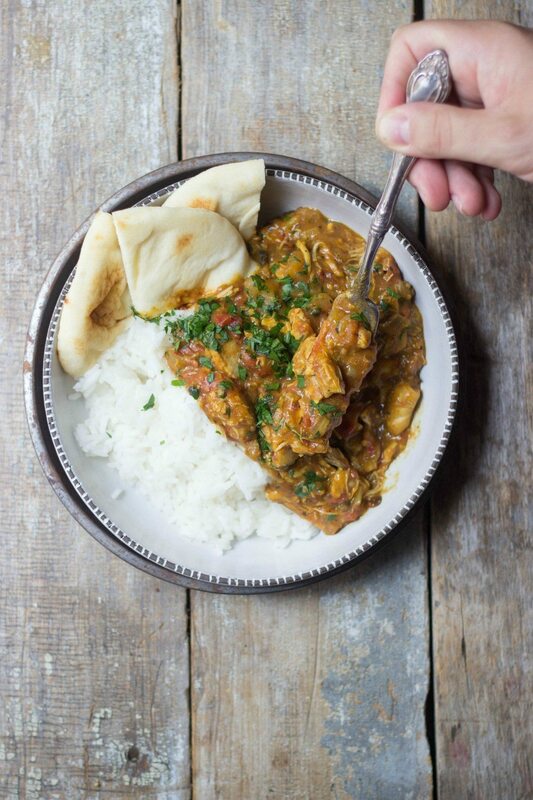 Serve with rice, naan and fresh cilantro.